Thanks to Karen Barry from the VICLMP program for sending us this project update! 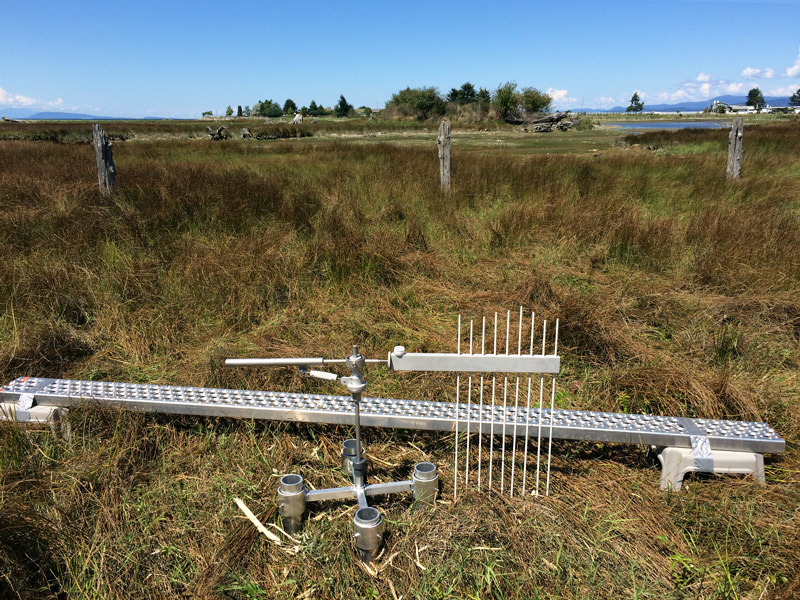 The Vancouver Island Conservation Land Management Program* has initiated a long term monitoring program to assess the health of estuaries and salt marshes on the east coast of Vancouver Island with support from HCTF and other partners. The goal of this monitoring program is to ensure that conservation lands provide high quality, accessible habitat for fish and wildlife, and to identify conservation concerns resulting from threats such as sea level rise, invasive species, or other human-induced changes. By implementing a standardized monitoring program, we can ensure investments made towards protection of sensitive estuaries are secured for the long-term. 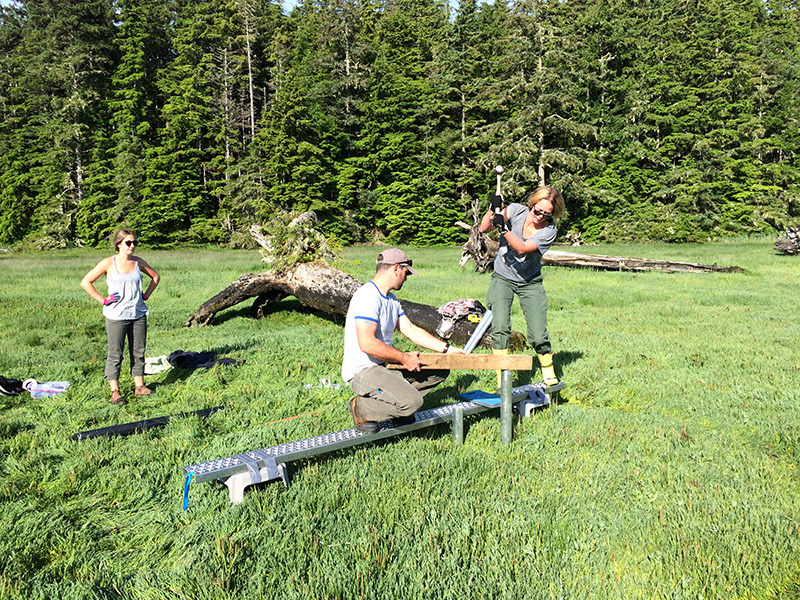 To determine the resiliency of coastal estuaries to sea level rise, we are installing Surface Elevation Tables (SET) platforms in several estuaries this summer, including Quatse River, Cluxewe River, Salmon River, Englishman River, Nanaimo River and Cowichan River estuaries. These devices allow us to see how salt marshes and estuaries are changing over time, by measuring changes in elevation of the substrate. The SET consists of an aluminum platform that is permanently installed in the estuary and anchored to prevent any movement. To take measurements, a specialized reader arm is brought out to the estuary, mounted to the platform and several rods are lowered from the arm onto the surface. Because the location and orientation of the device is fixed during sampling, we can record highly precise elevation measurements. Annual fine-scale readings are compared over time to see how much deposition or erosion is occurring. When measurements indicate a positive change in elevation, it means that sediment is being deposited, the plants are healthy and stabilizing the sediments, and the underlying marsh soils are getting thicker (accreting). This is a natural process in healthy salt marshes which increases the resiliency of estuaries to rising sea levels. In contrast, negative readings indicate decreasing elevation which means that the marsh surface is sinking (subsiding) or eroding. When the rate of sediment deposition (or accretion) does not match or exceed the rate of subsidence or sea level rise, the salt marsh can eventually “drown” meaning that it becomes sub-tidal. This can result in significant habitat changes for fish and wildlife; for example, vegetated salt marshes can become unvegetated mud flats. Results from our SET measurements will provide important information about local ecosystem change that can help inform management. Specifically, we will gain a better understanding of whether our estuaries are resilient over the long term, what habitats may be most vulnerable to sea level rise, and what potential restoration actions may be warranted to maintain or improve fish and wildlife habitat. * The Vancouver Island Conservation Land Management Program (VICLMP) is a strategic partnership program with Environment Canada-Canadian Wildlife Service, the Ministry of Forests, Lands and Natural Resource Operations, Ducks Unlimited Canada, The Nature Trust of British Columbia, and funding from Habitat Conservation Trust Foundation. VICLMP’s work focuses on managing over 100 conservation areas on Vancouver Island and the central and north coasts.